Dating back to 1857, The Cotuit Oyster Company has produced one of the oldest brand name of oysters in the United States. Shellfish cultivation was practiced by the Native Americans and later by the colonist on Cape Cod. 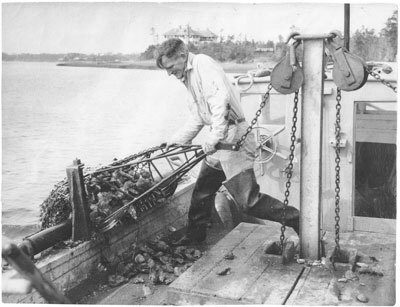 The Cotuit Oyster Company has origins dating back to the mid 1800’s. In 1857, Capt. William Childs returned from a life at sea to the life of an oysterman. His business became one of the biggest on Cape Cod. Back then oysters were packed into wooden barrels and transported across the Cape in large wagons to the railroad depot in West Barnstable. From there, they were shipped by rail to Boston, New York and other cities in the northeast. By 1870, six other oyster companies worked the bottom of Cotuit Bay. In 1894, Childs’ son Samuel decided to go into the business himself. He established his oyster shanty at the present location of the Cotuit Oyster Company. In 1912, Harry Height, an executive at the Eastman Kodak CO. bought out most of the independent oysterman and formed the Cotuit Oyster Company. In 1923, he sold his right to the Seacoast Oyster Company of New Haven, Conn. In 1960, the company turned over the grants to their manager Andy Post. 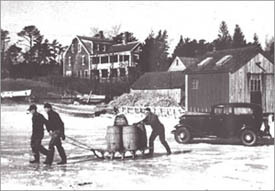 Three Cotuit residents bought the company and incorporated it, renting the property and the name along with the trademark: Cotuits-R-Superior ™ from the Seacoast Oyster Company. Andy Post operated the business up until 1973 when Richard Nelson bought the company. Mr. Nelson ran the business up until 2004 when Chris Gargiulo took over as President and owner of Cotuit Oyster Company, Inc.